Chris Powell, lately retired as Managing Editor of the Journal Inquirer newspaper, was asked some time past what should be done about “fixed costs,” to which he replied, “Unfix them.” A fixed cost is one that legislators who have pledged their troths to unions are disinclined to unfix for politically insidious reasons. So long as decision-making in matters of salaries, pensions and benefits remain in the hands of unions negotiating in secret with obliging governors, cowardly legislators subject to reelection will be more than happy to deed their budget responsibilities to others who will "fix costs" so that they then cannot easily be ameliorated by constitutional means. The state was taxing more and getting less, not a surprise to anyone familiar with the law of diminishing returns. At some tipping point in the tax scale, tax increases produce less revenue. Steadily increasing labor costs reduce a state’s ability to meet other more important obligations – especially when the state is averse to implementing long term, permanent reductions in spending. Prime Minister of Britain Maggie Thatcher famously said the trouble with socialism is that “sooner or later, you run out of other people's money.” The same holds true in a progressive state like Connecticut in which labor costs continue to rise but further taxation is no longer possible because there are limits, economic and political, to taxation . 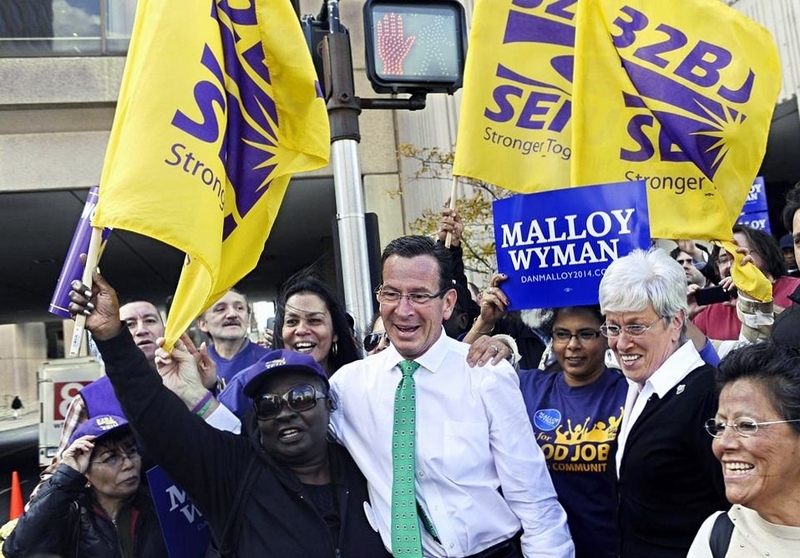 If you cannot reduce labor costs through sensible and necessary measures, and if you cannot meet rising costs through tax increases, the only remaining option open to you, if you are a professional politician, is to commit hara-kiri and deed the intractable problems to your successor – the path chosen by Governor Dannel Malloy, who had declined to defend his ruinous policies by running for a third term in office. The way out of the dark and forbidding forest is the way in – in reverse. Connecticut must move “fixed costs” into the fixable column overseen by elected legislators. This can be done in part by removing pensions and benefits from items negotiated during union-administrative contractual lovefests. Better still, why not allow elected legislators to set all presently negotiated items through statute? By eliminating union contracts and collective bargaining altogether, the General Assembly will simply be reassuming its constitutional obligations; it is the legislature, not the governor in conclave with unions, that is constitutionally obligated to appropriate and expend tax money. It is our elective system of government that holds legislators responsible for getting and spending, and this constitutional authority cannot be farmed out to unions and arbitrators without fatally damaging our republican form of government. Who died in the Constitution State and left unions, arbitrators and cowardly House and Senate leaders our bosses? In a summary section of “Above The law,” the Yankee Institute provides common sense reforms that, if instituted, “will restore democracy to the Constitution State and secure fairness for taxpayers." These reform measures include: ending the supersedence of labor contracts over state law; prohibiting unelected arbitrators from writing law; promulgating a law requiring unions to undergo regular recertification elections by workers; require the publication and public distribution of all government union reports; limit collective bargaining to wages only; prohibit government employee layoffs based solely on seniority; allow all government workers to opt into union membership every year; at the same time, allow workers to refuse union membership and represent their own interests; enact right-to-work laws for private sector employees now operative in 28 states; eliminate card check and make secret ballot elections the sole method by which workers may select or vote out a union; and lastly, enact meaningful and long term public pension reform. A government that cannot regulate itself cannot sustain itself as a representative republic, but must eventually become a fixed, inalterable administrative state that abolishes self-rule through constitutionally prohibited means – such as distributing constitutional obligations to unelected bodies unanswerable to the people.